The photos on this page may be used on websites and promotional materials for events where Laura Rubinstein has a speaking agreement in place. Click on the image below to view full size, then right click to save to your computer. Laura Rubinstein is an award winning Digital Media marketing expert, Business Transformation Strategist, and Certified Hypnotherapist. She is the founder of Social Buzz Club (an online content amplification and syndication network with over 150 million reach) and creator of the Savvy Social Media Success course where she helps business owners create a brand, buzz and profitable relationships. With the over twenty years of marketing consulting experience, Laura has optimized marketing plans and developed branding strategies for more than 1,000 businesses across the United States, the United Kingdom, Australia, and Canada. She is the author of several marketing, personal development, and social media books including the bestseller, Social Media Myths Busted: The Small Business Guide To Online Revenue. Laura’s clients consistently increase their net worth and expand their client base (often times doubling their business). She regularly speaks at national conferences and for organizations such as American Express Cruise Planners, Xerox, and the National Christian Writers Association. Her blogs are featured on genConnect.com, YourTango.com as well as her popular TransformToday.com blog. Laura, a Vanderbilt University alumnus, draws on an analytical nature, strong interpersonal skills, diverse business experience, team-oriented nature, and creative problem-solving abilities which make her coaching, branding, and marketing programs highly effective. Laura Rubinstein is an award winning Social Media and Marketing Strategist. 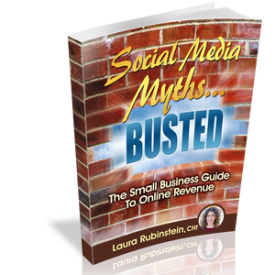 She is the author of the bestselling book: Social Media Myths Busted: The Small Business Guide To Online Revenue. She is the founder of Social Buzz Club, influencer network and gamified content sharing platform. Her mission is to help business owners, thought leaders, and coaches with an overwhelming “to do” list to THRIVE using savvy social media strategies and time saving systems. She is a highly sought after speaker and consultant who has optimized marketing plans for over 1,000 businesses with innovative profit-generating strategies. You can read some of them on her popular blog at TransformToday.com.